Day Two in Las Vegas! This is a continuation of a travel series of a road trip I took to Las Vegas with my husband in late May. To start at the beginning, read THIS POST. The rest of the posts are HERE, HERE, and HERE in chronological order. Our second day in Las Vegas was our fourth day of vacation and the most relaxing one. It was the only day of our vacation that we did not have to drive anywhere. We had the whole day to just relax and enjoy Vegas, and after three long days in the car, we needed it. The night before we arrived in Vegas during the supper hour and we just spent the night walking the south end of the strip. Now it was morning, and we were feeling refreshed after a good nights sleep and we were ready to see what the north end of the strip had to offer. We saved time and money by just having breakfast in our room. I used the coffee maker in my room to brew coffee and we had granola cereal and soy milk because we were blessed with a fridge in our room! After that we headed back out into the Flamingo Gardens because I wanted to experience it in the peaceful quiet of the morning without a lot of people around. I'll share those pictures on a Sunday Gardening Post as this one is already far too photo heavy to add those as well. As I stated in my last Vegas travel post, it was so fun to walk the strip and see all the hotels that I've seen only in pictures in person; especially the old ones, like the Treasure Island. Sometimes I think I enjoy those hotels more than the new fancy ones; such history! I know after walking the strip and seeing all the hotels, the one we stayed at and liked the most was The Flamingo. I felt the most comfortable there as the people who stayed there were the most like us, and I love the vintage atmosphere of the place. 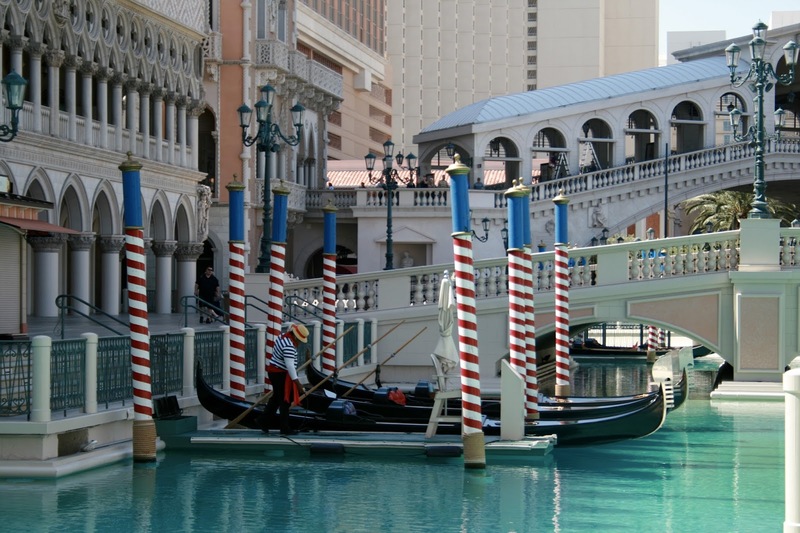 Las Vegas is a food lover's paradise, but it is also a very expensive place to eat. 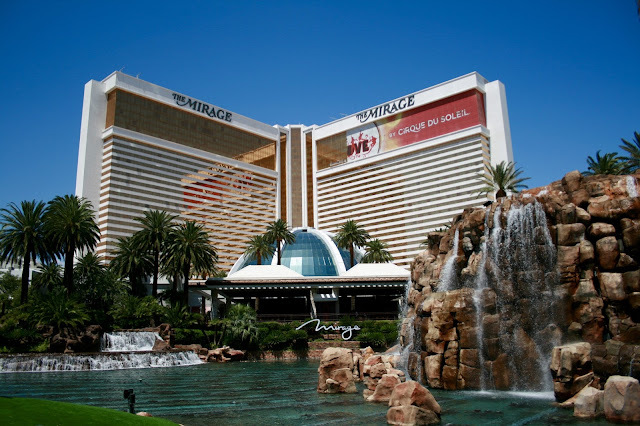 Some of the best restaurants in the world are in Las Vegas and are booked months in advance. We only ate at one fine restaurant while there, and the rest of the time we chose cheap eats. There was just so much to see and I wanted to explore as much as possible, that I didn't want to spend much time in a sit down place. 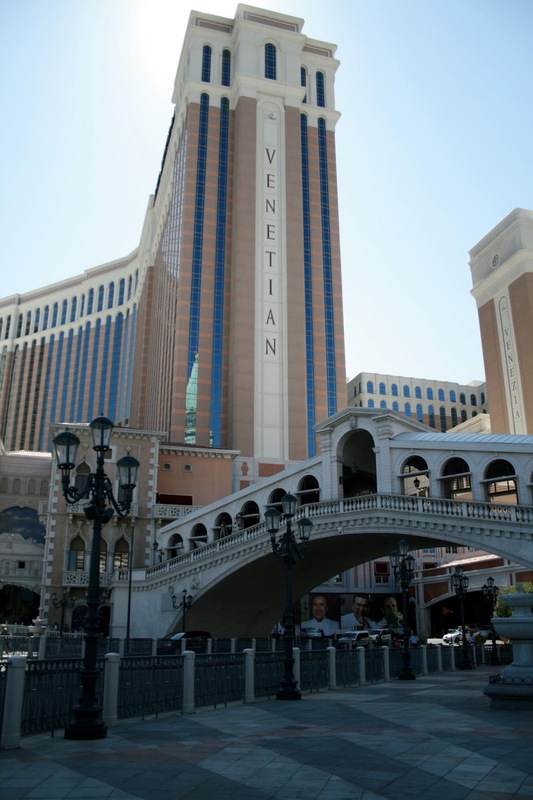 If your going to Vegas on a budget like we did, you can eat inexpensively. 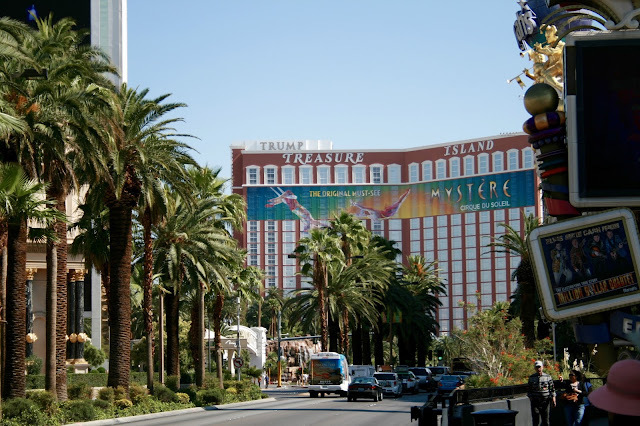 Try to get a room with a coffee maker and refrigerator (believe it or not, a lot of Vegas hotels do not include them) and you can save money on breakfast like we did. For lunch, there's lots of cheaper alternatives like this fun McDonalds, Panda Express, and Chipotle. They also have several Walgreens stores on the strip where you can buy salads, fruits and veggies, and inexpensive beverages if your trying to eat healthy, but cheap! We chose to go inside this fast food venue under the McDonalds for lunch. There was a New York Pizza place plus the Panda Express and Chipotle with a common eating area. My husband chose the oriental fast food and I chose Mexican! I love anything Italian. My house is decorated in the Tuscan style and I love Italian food and Italian gardens, so of course I loved the Venetian! The detail the architects go into to create these amazing hotels is unbelievable. I love the gondolas, and we even spotted one gondolier getting his boat ready for the day. 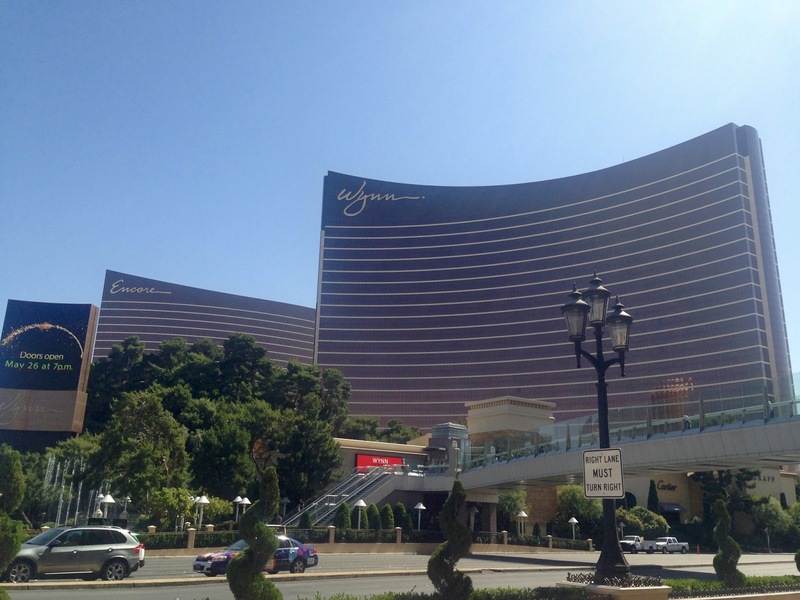 At my last dental appointment, my dental hygienist told me that she stayed at the Wynn when she was in Vegas. She was there with her husband who had to attend a convention there. She said it was the nicest hotel she had ever been too but she felt very uncomfortable there because she wasn't use to such niceties. "I'm just a small town girl at heart" she told me. So of course, I had to check this fancy hotel out! They had a much smaller, but pretty fountain show just like the Bellagio. See the video of this show at the end of my post. 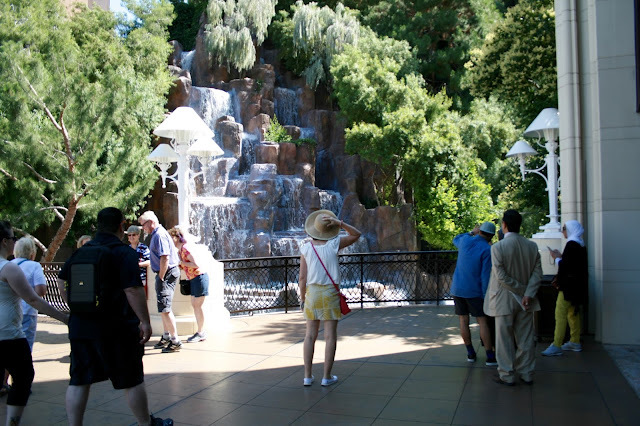 They also had several other amazing water features like this waterfall. 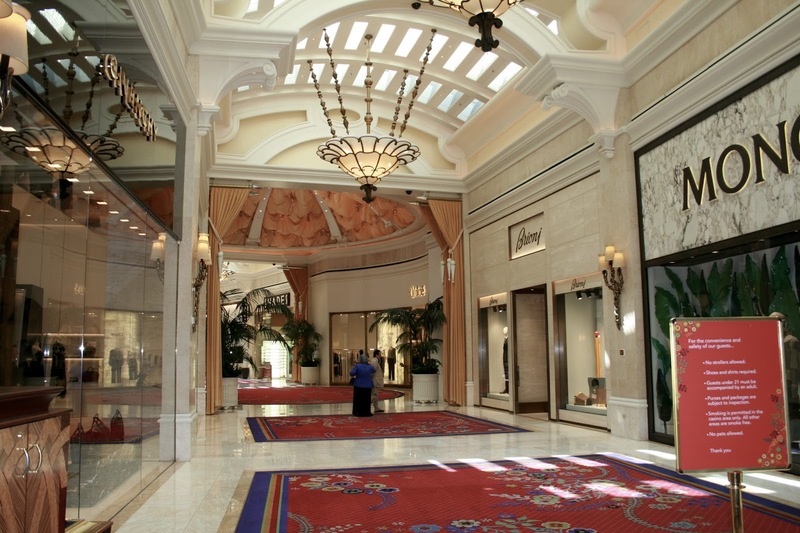 The inside of this hotel is so grand! I love the light coming in through the arched ceiling. And just look at those gorgeous chandeliers. 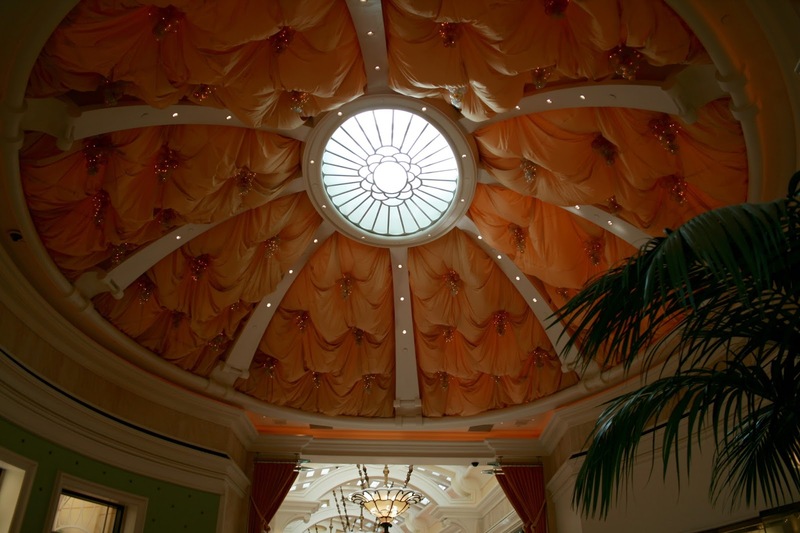 This domed ceiling was tufted with peach fabric and had crystal grapes hanging down. 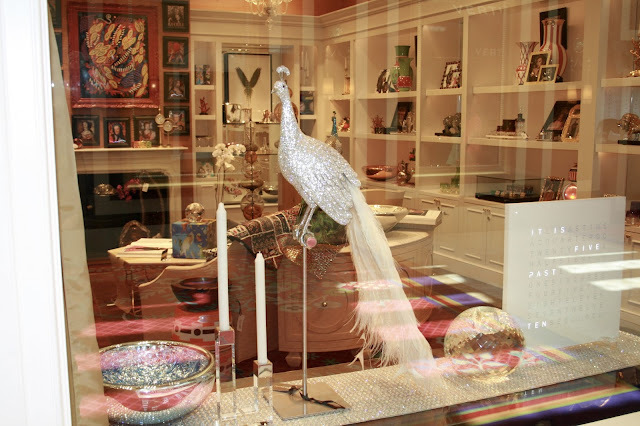 Of course, all the stores were completely unaffordable for the average person to shop in, but it's still fun to window shop! I almost died when I saw this sparkly white peacock. My daughter and I love peacocks! I loved the rich colors and lanterns hanging down from the ceiling. The large window is where the hotel pool is located. The Wynn also had a lovely indoor garden feature similar to the Bellagio gardens but not as big. I will show those pictures on a Sunday Gardening Post as well. 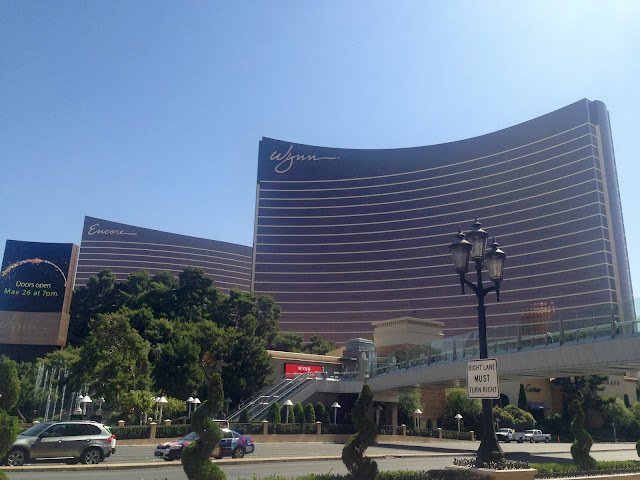 After walking inside the Wynn, we pretty much reached the end of the strip and decided to cross the street and check out the other side. 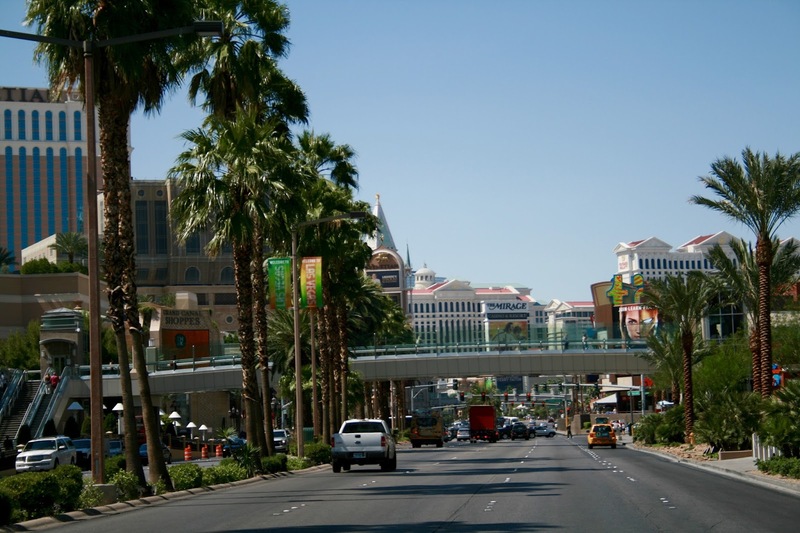 This is the view looking down from the North end of the strip South. 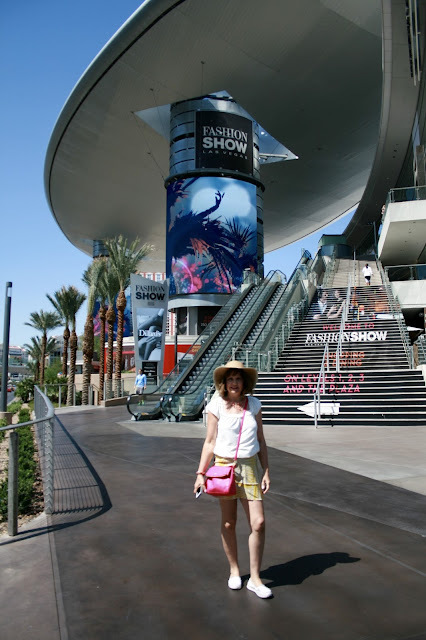 I kept reading about The Fashion Mall so I was dying to check it out. No one really explained to me what it was so in my mind I thought it was a mall, but also a place that might have daily fashion shows or workshops. I was disappointed to discover it was just a mall. But it was a very nice, large mall. It had all the usual stores like Macy's and Forever 21. We only walked about a quarter of it, then went back outside. 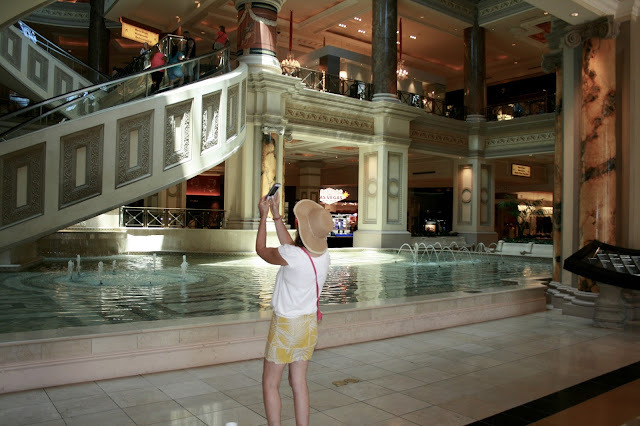 If I were in Vegas for a week, I would have shopped all day in that mall. 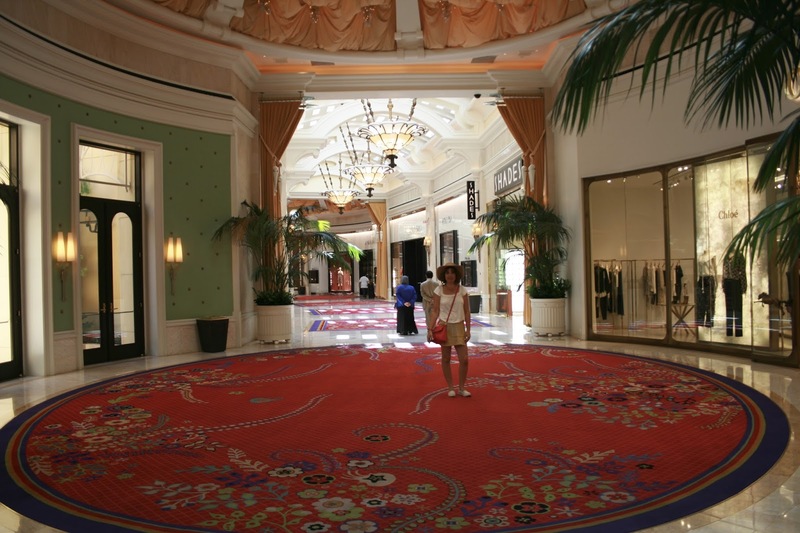 But I was only in Vegas for one day, three nights, so I had to use my time wisely and spend it on things I wouldn't be able to see anywhere else...not a mall! The Mirage has gorgeous outside waterfalls and ponds. They also have a free volcano show at night, but unfortunately we were never on that side of the strip at night, so we missed it. There are many costumed women (and other characters) in Las Vegas who stand outside trying to get your attention. They desire you to tip them, and you are not allowed to take their picture without paying them. So my husband always secretly took their picture by holding the camera down and snapping it while he walked by. Such a schemer he is! Many of their costumes were absolutely gorgeous. I loved this all white one. I wonder what it is like wearing such a tall headpiece? Perhaps my favorite indoor area of all was the Forum Shops of Caesars Palace. My jaw literally dropped to the ground when I walked into this shopping center! 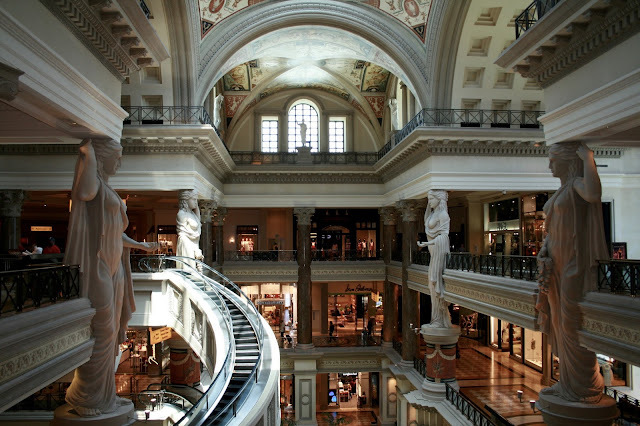 It's a luxury shopping mall filled with 160 speciality stores and includes designer stores such as Louis Vuitton, Gucci, Versace, Giorgio Armani, and Valentino. It was scary to hear on the news that three days before we arrived, men armed with hammers walked into the Rolex store in this mall and smashed display cases, stole jewelry, and beat up a guard. 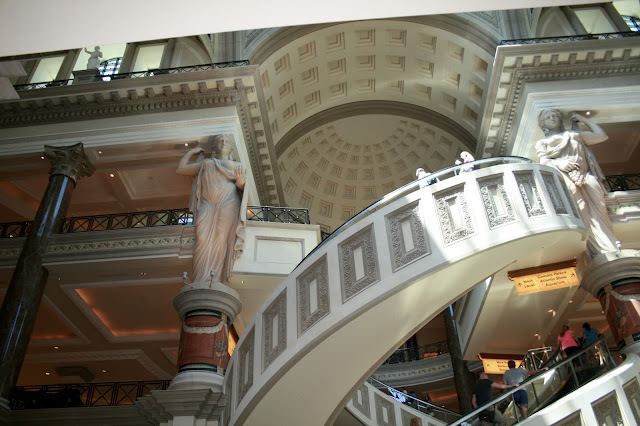 Well obviously there was nothing in this mall that was in our price range, but we sure enjoyed the Roman architecture. We loved these sculptures of these Roman women/gods holding up the ceiling. And the curved escalators are an architectural marvel. We never were able to see vintage Vegas (Fremont Street), which was a huge disappointment to me, for I prefer seeing history over new stuff. 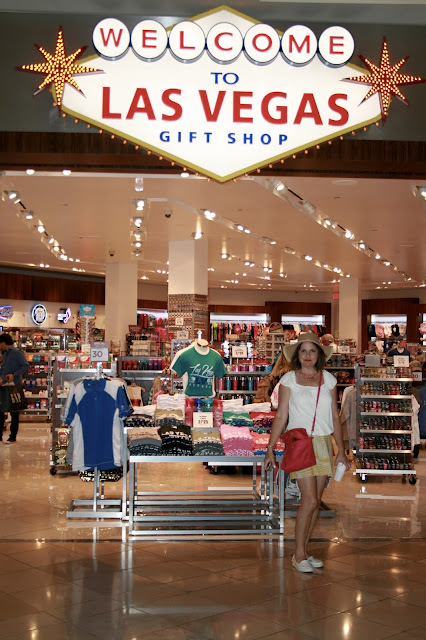 I really wanted to get my picture taken in front of the famous Las Vegas sign. So my husband appeased me and had me stand under this gift store sign instead. Ha-ha Todd! Obviously we did not buy a thing in this mall, but we went all the way up to the top on the curved escalators and just took a ton of pictures of this stunning architecture. I love the colors, the light coming in through the large ornate windows, and the paintings on the ceiling. 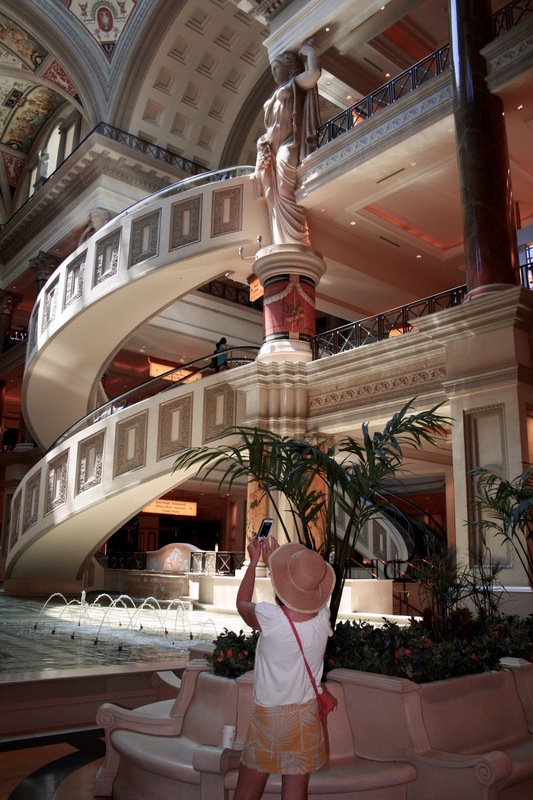 And to give you an idea of the size of these statues, look at her in comparison to the escalator and imagine someone standing on a step. Wow! The outside of the Forum is almost as spectacular as the inside. 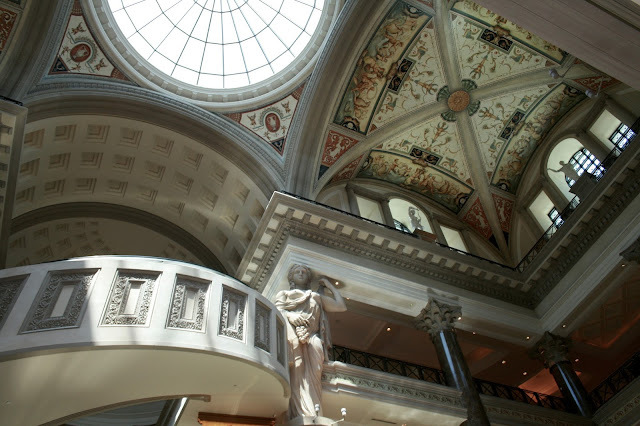 There are are two fountains, one of which is this large one of the Greek god Laocoon and his sons. Walking back to our hotel we spotted these two scantily clad showgirls so my husband yet again, stole a picture for memories. Too funny. After walking all morning, we decided to spend the afternoon poolside. 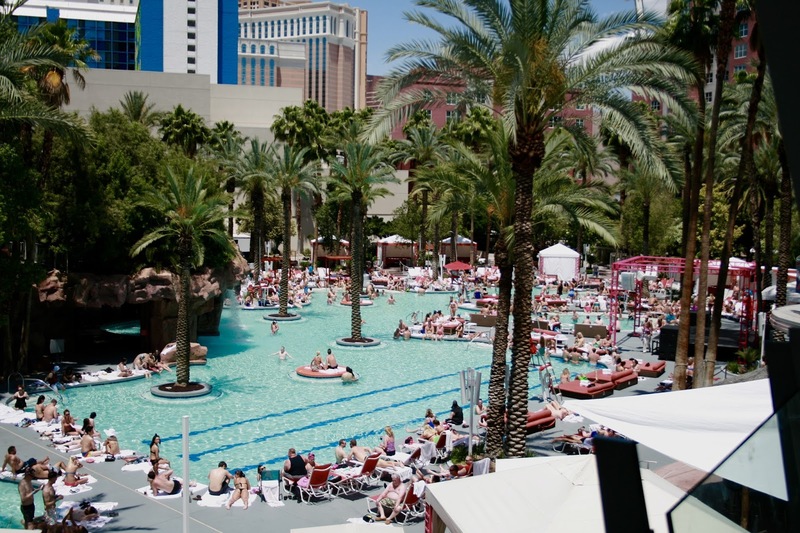 The Flamingo has one of the best pools in Las Vegas. A lot of people stay at the Flamingo just to enjoy this pool. They have a over 21 pool, and then a separate pool area for children and families. They also have two other smaller children pool areas. The pools include cabanas (You have to pay for them and reserve in advance) and fun features like water falls, fountains, and slides. They are super popular and terribly crowded. We were in Vegas during the off-season, and it was still so crowded we couldn't even find a spot to lay our towel on the cement. We at first went to the over-21 pool, but the water was so cold it was unbearable to swim in it. Notice how no one is in the water, they are all lying in the sun! So then we went to the kiddy pool area where there were plenty of chairs. 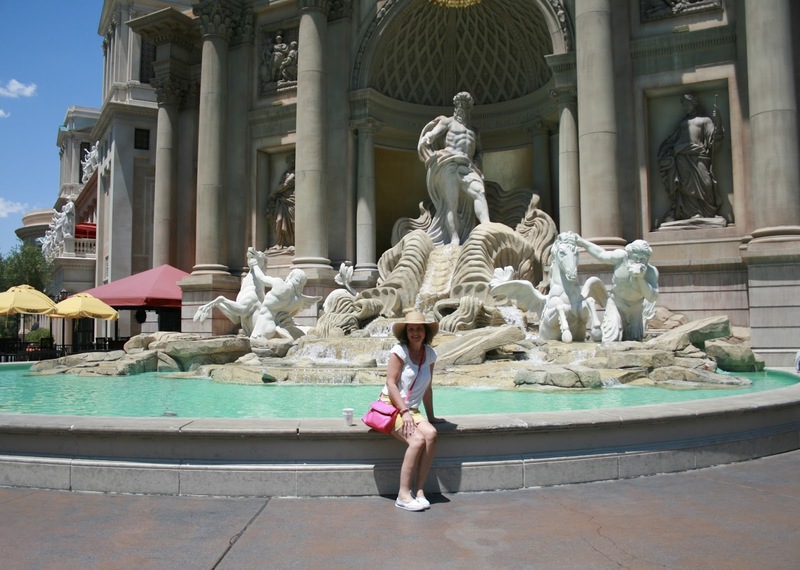 We then spent the rest of the day sleeping in the Vegas sun! 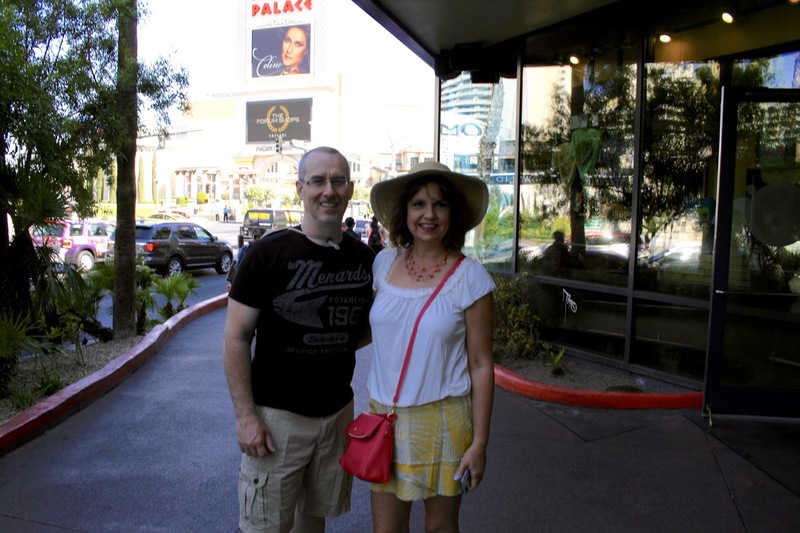 After our sun nap, we then headed back to our room to get ready for the main reason we came to Las Vegas in the first place...to see Celine Dion! Now a lot of people have complained to us that tickets to her concert are hard to get and terribly expensive. I didn't feel that way, but I go to a lot of broadway touring musicals and I pay on average about $300 for two tickets with good seats, so I felt the ticket prices for a Celine Dion show was fair. I went on-line and purchased my tickets off of the Caesars Palace website in March for a show in May. When I went on-line, all the front row seats (which cost $500 a piece) were taken. The only seats left were way in the back side floor level, way in the back side balcony level, or front and center top balcony. We decided front and center top balcony was the best for us. They cost a little over $100 per ticket plus fees. As always, someone saw my hubby taking pictures of me and offered to take a picture of the two of us. We left our DSLR back at the room and we only had my IPhone, so the pictures weren't the best. And for those of you wondering how tall my husband is (I had a guy on Instagram ask me about that believe it or not), he is 5'9 and I'm 5'7. I just have super tall heels on, so that's why I look taller than him. He didn't mind at all, in fact, he loved it! He's confident to handle a tall woman on his arm. Here is what the inside of The Colosseum looks like. We were seated a few rows above where I'm standing. The facility holds 4,100 people and the concert was completely sold out. Now everyone wants to know how the concert was....well amazing of course! It's Celine Dion, can it be anything else? She did all her usual numbers that she is famous for, plus medleys of other popular songs and a jazz medley. They used a lot of spectacular lighting effects for the show. She changed costumes with every set and I didn't know what I was more enamored with: her voice, or her clothes! The very first dress that she wears in the first set is the most spectacular. I've never seen such a beautiful dress in my entire life. 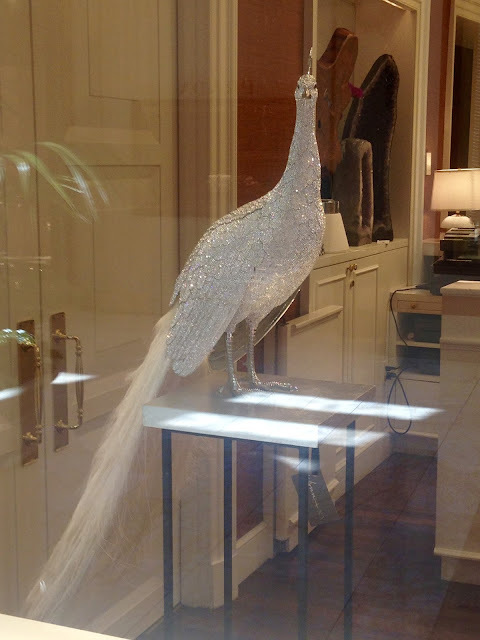 It is a long flowing white dress dripping in sequins. My only complaint, is I wish they would have had close ups of her up on a screen constantly so that those of us with far away seats could have seen her expression. But because so much emphasis was put on the light show, they did not. They did do a close up screen shot of her when she spoke of the loss of her husband. It was so heart-breaking to hear her explain how her and the kids are doing. I can't even imagine what she is going through. They also showed old movie clips of her childhood years and Renee and the kids....again, very heart-breaking, but moving to watch. And of course she sings "The First Time Ever I Saw Your Face" while your watching those clips...kinda hard to keep a dry eye! She had a full orchestra and a great group of back up singers. And of course the highlight of the entire show was her encore ending where she concluded with the song "My Heart Will Go On" and was lifted up into the air surrounded by water. Can you see how she enveloped in water in the picture below? She's standing on a pedestal that came up out of the floor...it was so cool! It was really exciting to see someone so famous in person. Growing up in Milwaukee I've seen a lot of famous rock n' roll bands in my life, but prior to this concert, the most famous singer I've seen before was Bruce Springsteen. This was quite a treat to me and I enjoyed every minute of it. 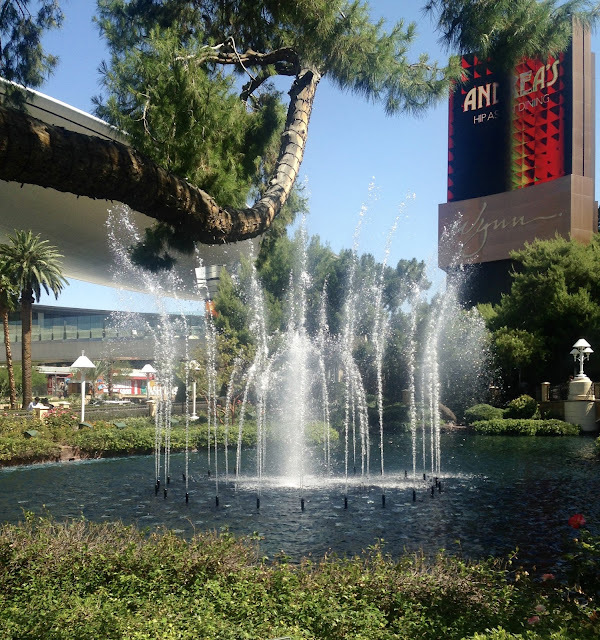 And now, I will leave you with the Wynn fountain video. It's super short...so even though this post was long, you still have time to watch it! It's quite cheerful and it will make your day! 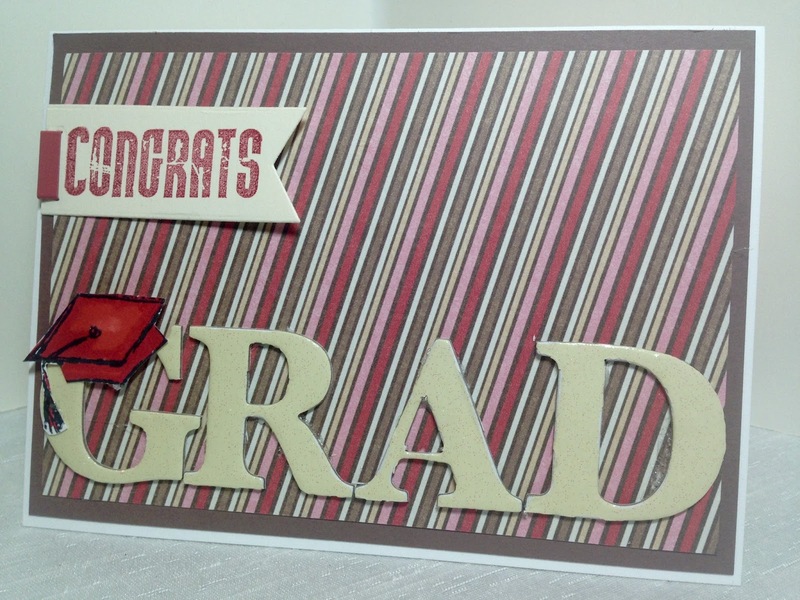 This is a card I made for a young man who graduated high school. I tried to use a masculine design and some of the colors of his school (red). It was a very simple card to make. The striped background is just designer paper adhered to a panel of chocolate brown card stock and then onto a white card base. 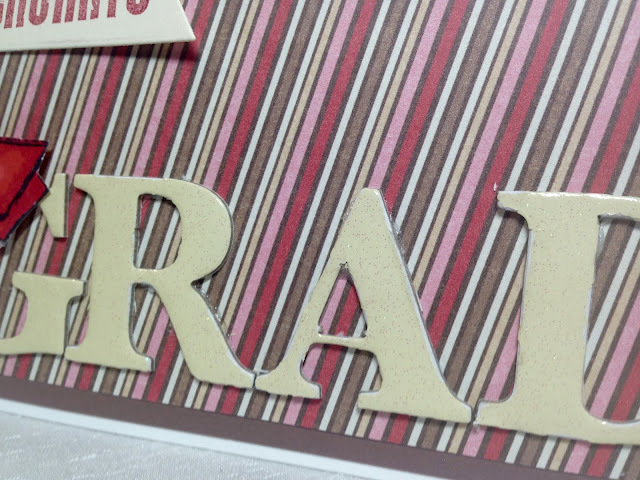 I then glued pre-purchased chipboard letters onto the designer paper. 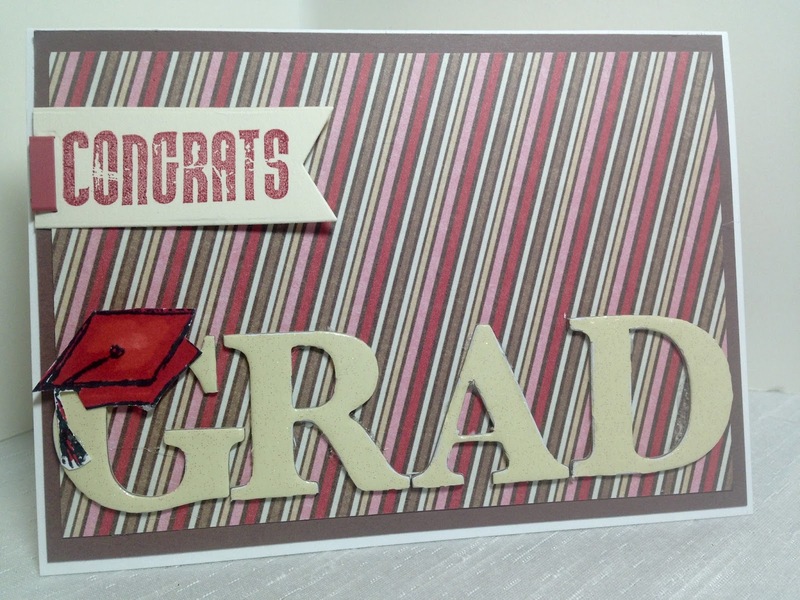 The graduation hat was stamped, colored, cut out, and then attached to the letter "G". The sentiment was stamped onto a Very Vanilla piece of card stock then cut out with a MFT die. 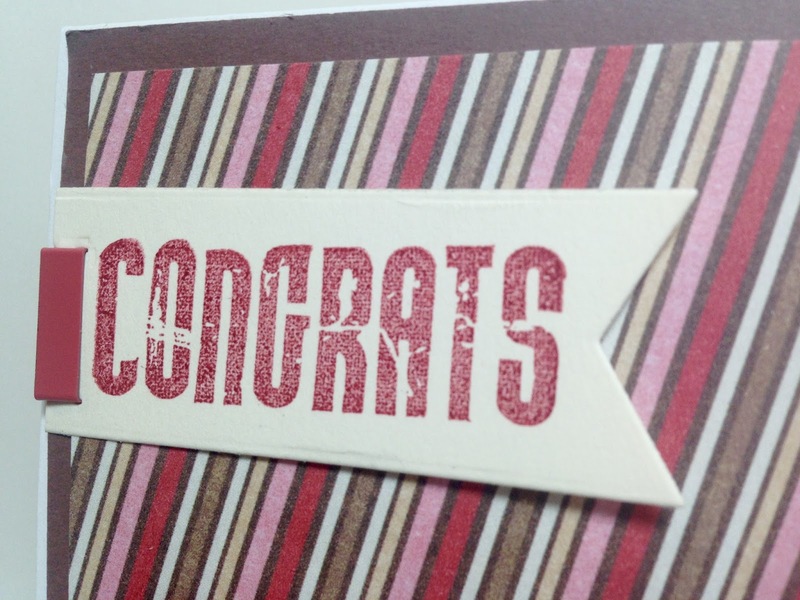 Then I used a decorative stapler and decorative red staples to adhere the sentiment onto the card. 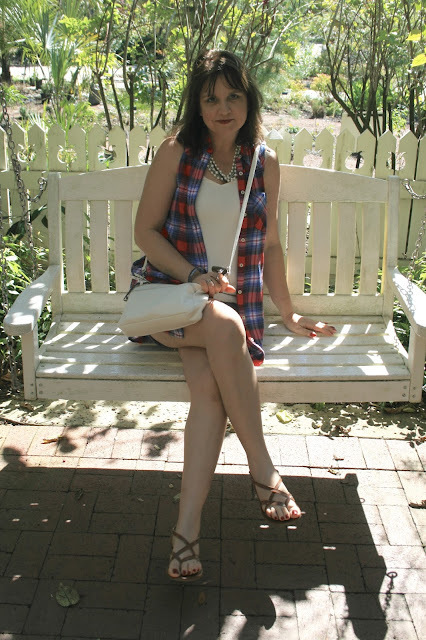 Be sure to check the very last Between the Lines post HERE! 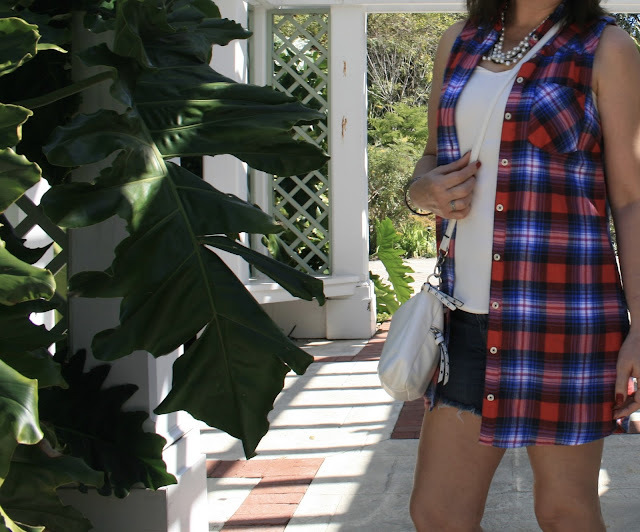 I picked up this cute lightweight flannel sleeveless dress on clearance at Forever 21 for less than $5.00. It came with a skinny brown belt and is meant to be worn as a dress. However, it is just too short for my comfort zone to wear as a dress, so I've been wearing it as a vest. I wore it twice since I purchased it: once in winter as an extra layer and again when I was in Florida this past February. So yes, if you notice I look different in these photos, it's because they are old. I'm a few pounds heavier and my hair is longer. 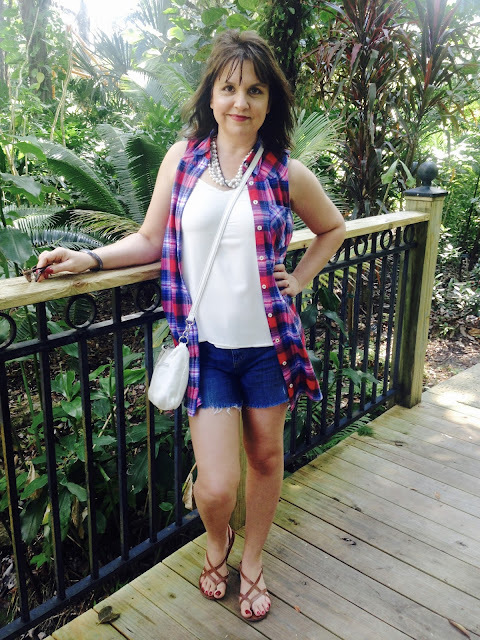 I saved a lot of my February Florida fashion photos to share on my blog during the summer months because I felt no one was interested in looking at summer fashion during the winter months. Little did I know though that my appearance would drastically change so much in four months. Many native Floridians dress for winter even if the temperatures are mild. It cracked me up seeing people wearing tall boots and thick sweaters in seventy degree weather. We bring out the flip flops and cut offs when the temps hit the sixties in Wisconsin! Well I left cold and snow to experience warmer weather in February, so I wasn't about to bring my winter clothes with me! 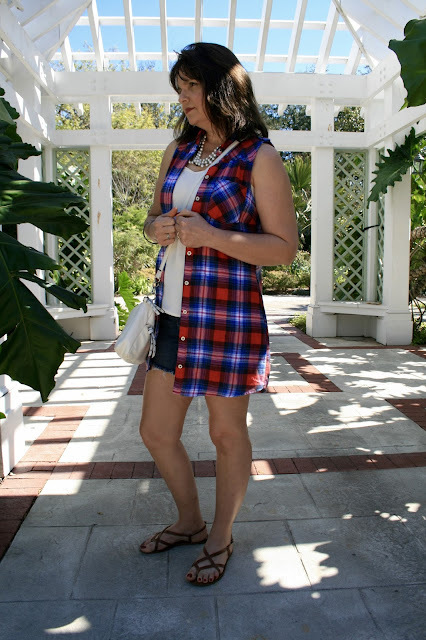 I chose to dress for summer temperatures, but I felt this lightweight flannel dress would be a great pattern and color for the tropical winter season. 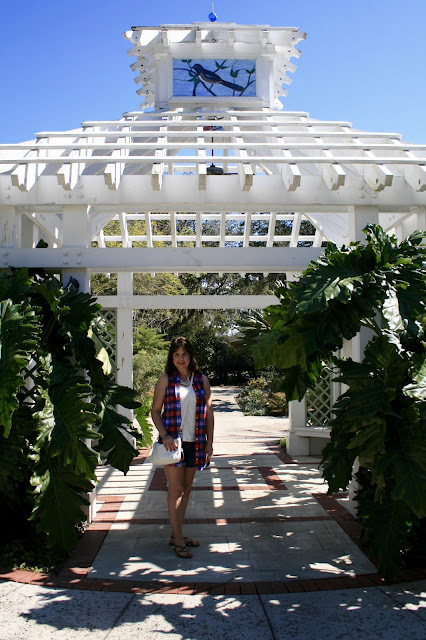 All the pictures were taken at the Orlando Botanical Gardens. What a beautiful place! I love the rich, bright color of this dress. It is so soft too! I did try wearing it as a dress with red knit work out shorts underneath to see if I would be more comfortable, but it seemed to cling to the shorts and add extra bulk, so that still was a 'no'. When I wore the dress in winter, I wore it with dark skinny jeans. I never took a picture because we had company over that day and well....I was busy. I don't make appointments to take pictures of outfits like a lot of fashion bloggers do. I just go about my life, and try to get someone, usually my hubby, to take a few snapshots of what I'm wearing while were out and about. 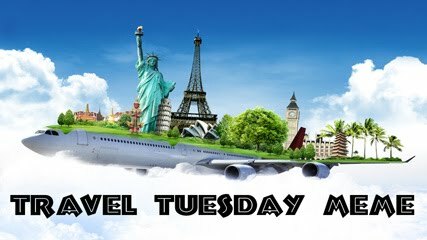 My blog is mostly about my life, not just clothes, so when I do a fashion post, there is usually a story behind it too! Underneath my vest/dress I wore cut off denim shorts (I did my cut off's the old fashioned way...they were jeans that wore out in the knees, so I cut them off and made shorts out of them! ), a camisole from Express (old), and brown leather sandals (old). I really liked how I had a winter look yet I was appropriately dressed for summer weather. I always love to add some femininity to my outfit when I'm wearing something more masculine like flannel, so I added this multi-strand pearl necklace. The only other jewelry I wore was a silver bracelet and my usual rings. I carried a white cross body bag because I was traveling. I don't know why designers are always making dresses so short these days. Most women only seem comfortable with a mid-thigh or slightly above the knee length dress. I read on a lot of blogs about women complaining about the short length of dresses these days and how difficult it is to find one that's a descent length. But I have found a lot of short dresses can still be worn with a little creativity. I love wearing short dresses over capris or leggings, and I've noticed a lot of women wearing them as long tunics over jeans too! And shirt dresses especially, like the one I have on, are perfect for wearing as long vests. The Big Beauty Room Reveal Is Finally Here! Road Trip Outfits and Head Bands Galore!